Aquatic is introducing a new group of showers and tub-showers for builders and homeowners who want the timeless, classic look of ceramic subway tile but with easy installation and low maintenance, all at an attractive cost. 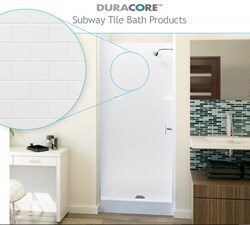 One-piece, DuraCore (TM) tub-showers featuring subway tile design now are available in two sizes and two additional units are scheduled for release in early 2014. Aquatic offers a fresh take on subway tile with new tub-showers and showers that combine traditional features with 21st-century enhancements. Aquatic's subway tile bathware is another way to get the same great look without the expense and work required for installing and keeping up tiles and grout. Aquatic – the world leader in innovative and inspired bathware – today announced a new group of showers and tub showers for builders and homeowners who want the timeless, classic look of ceramic subway tile but with easy installation and low maintenance, all at an attractive cost. Aquatic’s one-piece, DuraCore (TM) tub-showers featuring subway tile design now are available in two sizes – 66” x 36” x 80” and 60” x 32” x 80” (in the Western United States initially). Aquatic plans to expand its subway tile offering in early 2014 with the addition of a low-threshold, 36” x 36” x 80” shower and a larger 60” x 42” x 80” tub-shower. “We were inspired to develop these products because ceramic subway tile, which never goes out of style, has been enjoying a resurgence in recent years – this is another way to get the same great look without the expense and work required for installing and keeping up tiles and grout,” said Stacy Zar, Director of Marketing and New Product Development, Aquatic. ● Four-layer DuraCore construction (exclusively from Aquatic) so these units can withstand the rigors of shipping, installation and long-term usage. Aquatic also has designed the subway tile tub-showers and showers with comfort and safety in mind. They can be ordered with reinforcement for later installation of grab bars or with factory-installed grab bars in compliance with FHA and ADA requirements. Additionally, the shower slated for introduction next year will have a four-inch threshold for easy entry and exit. All units come with slip resistant flooring and are available in Aquatic stock and premium colors, including the signature DuraCore, ultra-bright, glossy Aquatic White. The clean and simple lines of Aquatic's subway tile units complement virtually any décor –- from vintage to modern and everything in between. 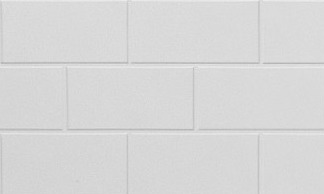 Since ceramic subway tile debuted in the early 1900s, the gleaming 3”x6” white rectangles have been an enduring favorite for bathrooms.